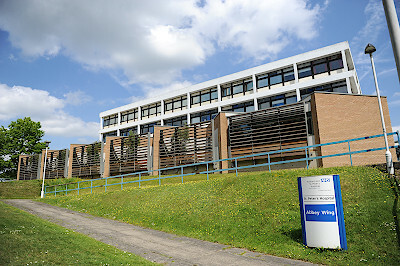 In this section, you can read recent news articles about the maternity department. We are delighted to announce the arrival of the quadruplets born at St Peter’s Hospital on Wednesday 11 July 2018. Three girls and one boy were delivered by caesarean section to Melisa Patino and Jon Belsey. 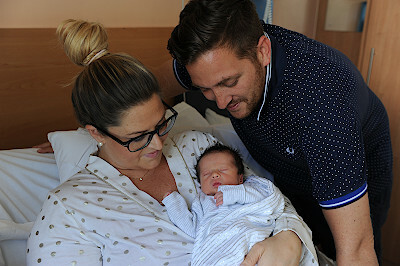 Mum Melisa and Dad Jon are over the moon and the couple decided to name the babies soon after they were born - the girls were called Evie, Maddison and Cassidy and the boy is Logan. From 8am on Monday 9th April 2018, a designated telephone advice and triage line will be available for pregnant women to access advice and support 24 hours day, 7 days a week from a midwife. Sadly, parents expecting twins are more likely than those expecting a single baby to experience complications and tragically this can sometimes lead to the loss of one of the babies. 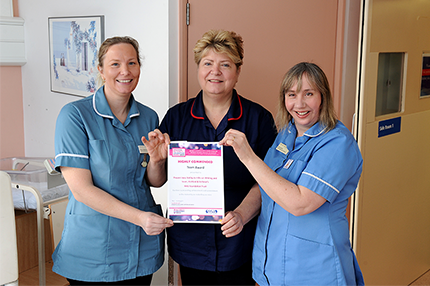 We are delighted to announce that our Infant Feeding Team’s skin to skin initiative ‘Project Joey’ has been highly commended by the London Maternity and Midwifery Festival in the team award category, on Tuesday 13th February. 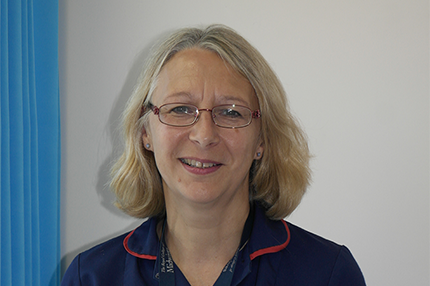 ‘Project Joey’ set up by Jo Wilding-Hillcoat, Infant Feeding Team Leader Midwife, aims to provide the ‘birth centre experience’ of uninterrupted skin to skin time with their baby as soon after birth as possible for all mothers including those needing care in theatre. 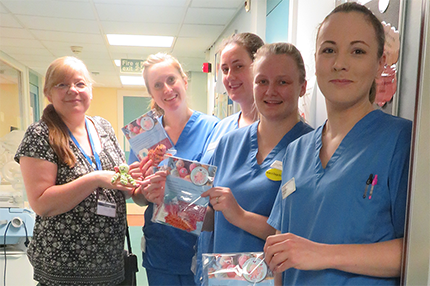 Angela Gray, an employee of Morrison’s of Woking, very kindly donated 30 gift bags to neonatal intensive care unit. 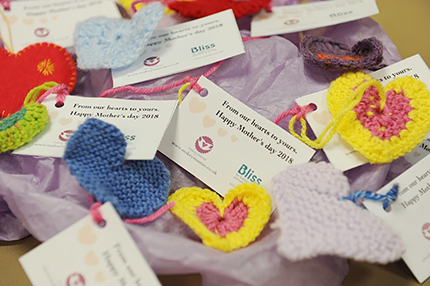 The gift bags contained pillows, key rings, cotton wool and mittens for mums on the ward over Mothering Sunday. Angela just wanted to say thanks for all the assistance she received herself from NICU for the birth of her children, including Noah who was born last Easter. 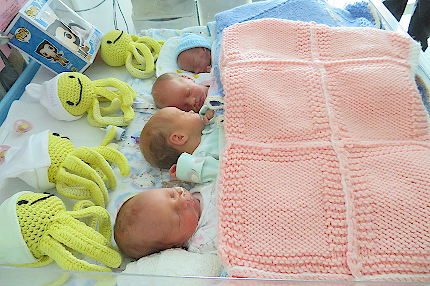 Volunteer, Sue Morris and a team of collaborators have been knitting octopuses for the neonatal unit at Ashford and St Peter's Hospitals to help premature babies. Sue said: "We are a group of people who crochet and knit little octopuses and jellyfish to comfort babies who decided to come into the world a little earlier than expected." 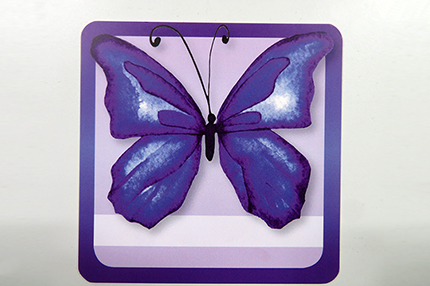 Ashford and St Peter’s have recently launched a support group for mums, or mums to be, that have Type 1 Diabetes and use an insulin pump. The support group was set up by Jo McBride our Diabetes and Insulin Pump Specialist Nurse and is held in our specialist diabetes centre Stephanie Marks. 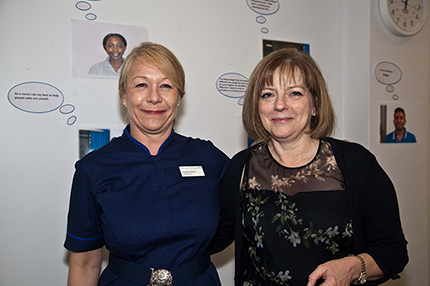 On Friday 27th October the maternity team at St. Peter’s Hospital welcomed Gill Walton, recently appointed as the new Chief Executive and General Secretary of the Royal College of Midwifes (RCM). 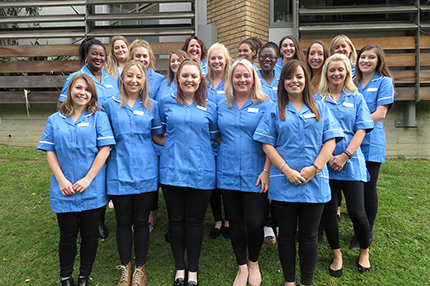 Lauren Brown, Practice Development Midwife, recently welcomed a group of around 20 new midwives on board at Ashford & St Peter’s (ASPH). She said: “The midwives are dedicated to helping us achieve our 4 P’s “Patients First, Personal Responsibility, Passion for Excellence and Pride in our Team. 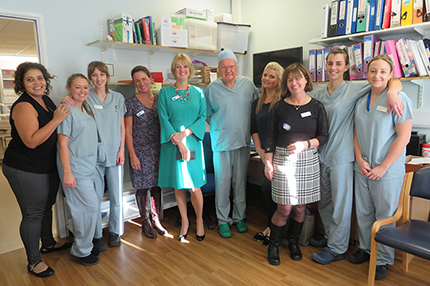 I look forward to watching them develop their careers at our hospitals”. 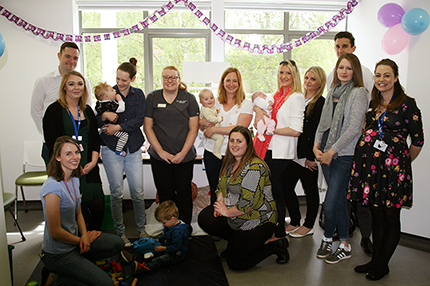 Ashford and St Peter’s Hospitals NHS Foundation Trust marked this year’s International Day of the Midwife by reuniting mums who had their babies at St Peter’s Hospital with the Midwives who helped deliver them. 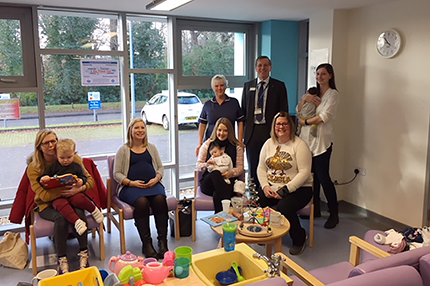 The Abbey Wing at St Peter’s hospital played host to the event last week which saw mums and midwives mingling and discussing life pre and post maternity. 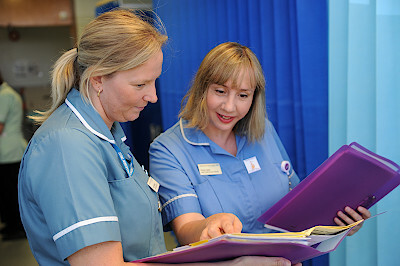 Jane Urben, Divisional Chief Midwife for Ashford and St. Peter’s Hospitals, has signed the Royal College of Midwives’ (RCM) ‘Caring for You’ charter, which is a commitment to improve the health, safety and wellbeing of her team of midwives, student midwives and maternity assistants at work. 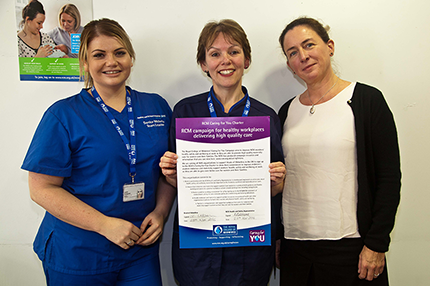 The maternity unit at St Peter’s Hospital is offering a new, non-invasive prenatal test, known as ‘SAFE’, to evaluate with remarkable accuracy whether a pregnancy is at risk of certain chromosomal conditions, such as Down’s syndrome. Making a mark on International Nurses Day, Ashford and St Peter’s Hospitals NHS Foundation Trust celebrated their fabulous nursing and midwifery staff, by conducting their very own special event - ‘Pride in Nursing and Midwifery Day’ - with over 140 people attending. 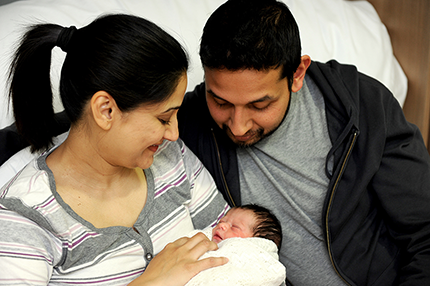 The maternity department at Ashford and St Peter’s Hospitals NHS Foundation Trust has been awarded a £30,000 government grant to buy a new life-like birthing simulator called SimMom. 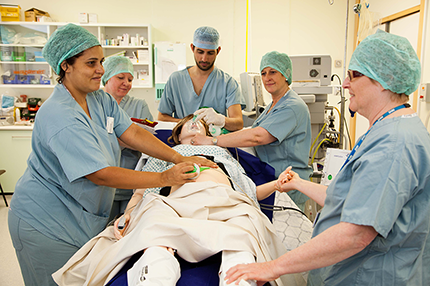 The realistic mannequin has accurate anatomy and functionality, complete with a ‘bump’ and a birthing baby inside, so the team can practice different labour and birth scenarios.